« PPO Dental Insurance: What is it? Dental X-Rays examination has become the way the doctor helps the patients to know their oral health, which is including the identification of mouth, teeth, and jaw problem.Through the dental X-rays, both the doctor and patient will see if there was cavity, benign or cancerous, hidden dental structures, and bone loss that hardlyobserved during visual examination. In order to find the dental problem of patient more precisely, there are two types of dental X-rays usually used in dentistry. They are the intraoral and the extraoral. Intraoral means the X-ray film is inside the mouth, while the extraoral means that the X-ray film is outside the mouth. Since the methodrequires the dentist to put the X-ray film or sensor inside the mouth, it will provide more detail information related to the patient’s dental health. It alsoallows the dentist to find cavities, both tooth root checking and bone surrounding the tooth, monitor the development of teeth as well as monitoring the patient’s general health of teeth and jawbone. Intraoral X-ray itself has three subtypes; they are including Bite-wing X-rays, Periapical X-rays, Occlusal X-rays. This method used for checking the teeth, both lower and upper teeth, from the crown to the level of supporting bone. It will help the dentist to locate the decay between the teeth and to know the bone density level that might have changed due to the gum disease. The bitewing X-rays are also useful to determine either proper fit for the crown or cast restoration, and useful for knowing the fillings’ marginal integrity. It is only capable of showing one area of the mouth. It is used to check the whole part of the tooth. This type of X-ray allows the dentist to determine the abnormalities of the root structure and the root surrounding the jaw, as it displays from the anterior to posterior of the teeth. This is the largest X-ray from the other two intraoral X-ray types. The occlusal X-rays help the doctor to know the full tooth development and the placement. The occlusal film will display every portion of the teeth, completed with the entire arch of them either upper or lower jaw. Different with the intraoral X-rays that show the detail information of teeth, Extraoral X-rays provide information of teeth, but the main objective of them is showing the jaw and skull. Since it does not provide detail information of teeth, the extraoralcannot be used for determining abnormalities of teeth. Just the same as the intraoral, the extraoral has several types within its type. Panoramic helps the doctor in locating the fully emerged as well as emerging teeth, identifying the impacted teeth, and useful for tumors diagnose. On a single X-ray, the panoramic X-rays will help the doctor to see the entire patient’s mouth area, the entire teeth in both the upper and lower jaws. 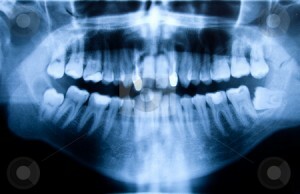 This type of X-ray is useful to see a particular layer of the mouth while blurring out all other layers. The doctor to examine structures that are difficult to clearly see usually uses tomograms. As for the example, the doctor who wants to examine the structures those are in very close proximity to other structures. The Cephalometricprojectionsusually used by the Orthodontist to develop their treatment plans. The main objective of Cephalometric projections is examining the teeth in relation with jaw and profile. This type of X-ray will display the entire side of the head. Sialography usually used by the dentist to check or see the salivary gland problems, such as blockages or Sjögren’s syndrome. It works by injecting dye, called a radiopaque contrast agent, into salivary glands so that the organ can be seen on the X-ray film. This method is very useful when examining the salivary gland’s problems due to the inability of the X-ray to display the soft tissue. Computed tomography, or also known as CT scan, is a type of X-ray that used to identify problems in the face, which is including tumors or fractures. Instead of used by the dentist, it is usually performed in hospital or radiology. In dentistry, the main objective of CT scan isto evaluate bone for the placement of dental implants and difficult extractions. Apart from those types of Dental X-Rays, there is also another type of X-ray used by the dentist in examining the patient. It is called digital imaging. The biggest different between digital imaging with the other dental X-rays is the X-ray films are sent to the computer directly so they can be viewed on screen, print out and stored. Compared to the other types of X-ray, this technique uses less radiation as well as save more time in getting the result due to the image can be seen on the screen right after being taken. Apart from that, the image can be enhanced and enlarged several times on the computer screen. This entry was posted by mimin on April 23, 2012 at 4:02 am under Dental Treatment. Tagged dental radiography, dental x rays and pregnancy, dental x rays cost, dental x rays frequency, dental x rays panoramic, dental x rays radiation, dental x rays safety, Dental X-Rays, dental xray danger, dental xrays cancer, dental xrays cost, dental xrays safety, dental xrays while pregnant, digital dental x rays, how often dental xrays, how to take dental x rays, read dental x rays, types of dental x rays, types of dental xrays. Both comments and pings are currently closed.